National and international attention is focused this weekend on the 50th anniversary of the protest at Selma, Alabama. Photos show President Obama and hundreds of others on the bridge where the civil rights movement made one of its biggest statements. In 2005 I wrote the article below, referring to the Million Man March held in 1995. 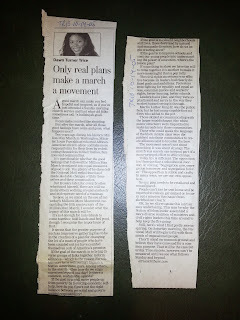 I wrote after the last march that I wished there were one person on each bus coming back from DC with a Directory (like the Program Locator at http://www.tutormentorprogramlocator.net ) listing tutor/mentor programs in the city where that bus was headed. 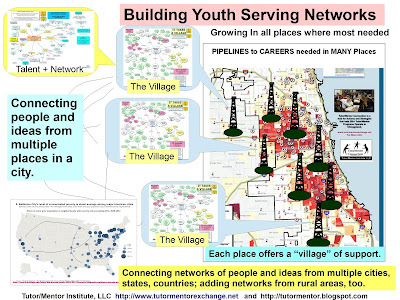 During the ride back that person could be talking about the Theory of Change offered by the Tutor/Mentor Connection, which focuses on getting more people consistently involved in helping kids in poverty neighborhoods grow up and enter jobs/careers. He could have used maps, like the T/MC creates, see Map Gallery, to show where poverty and poor schools were located in each city, and where existing programs were located. He could have been teaching the marchers about the constant need each program has for operating dollars, tech support, training and business partners who provide vocational learning, and leadership. He also could have been talking of ways churches, businesses, universities and hospitals could be partnering in sections of a city to launch new programs to fill voids. 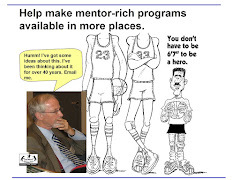 Finally, he'd ask for a commitment that these people would go to an on-line documentation system like the OHATS at http://www.tutormentorprogramlocator.net/ohats/home.aspx where they would document actions that each had taken to build or sustain volunteer-based tutor/mentor programs in their community. The last piece of information would be a web site address, such as http://www.tutormentorexchange.net, where the volunteers could go for more information about poverty, about mentoring and tutoring, and where they could talk to each other in on-line forums. This would also have provided a date and location for a follow up meeting, such as at the Nov. 17 and 18 Tutor/Mentor Leadership Conference in Chicago. This message is relevant today as readers look at images of #Selma and listen to the President saying "Patriotism is active, not passive. Those who love America prove it by working to perfect America. They continue marching." Since I posted this article I've written more than 1000 more articles focusing on leadership, planning, learning and other activities that need to take place. Below is a video done by a 2015 intern from IIT and South Korea, which guides visitors through information on my web site. One SELMA follow up activity that could be done in schools, faith groups and businesses across the country would be for volunteers to create their own "learning paths" pointing adults to information they could use to build and sustain the needed programs and policies that would make the next anniversary of Selma an even greater celebration of greater equality of opportunity in America. If you're in Chicago and interested in what I'm writing about, I encourage you to support my efforts, and share your own work by participating in the Tutor/Mentor Leadership and Networking Conferences that I've hosted since May 1994. The next is May 8, 2015. I'm looking for workshop presenters and sponsors now. Rahm and Chuy. Use Maps. Visualizations. Goals of Chicago Tutor/Mentor Conference.